This is an introductory workshop for contact centers to learn about gamification and how it can improve agent engagement in general and to achieve many more specific benefits, such as improving adherence to scripts, raising closing rates for sales and collection activities, reducing risks by improving compliance with disclosure requirements, and reducing the onboarding time for new agents by making training more effective. HOW CAN CONTACT CENTERS USE GAMIFICATION? · Group Activity 1: What can Gamification drives in the Contact Center? 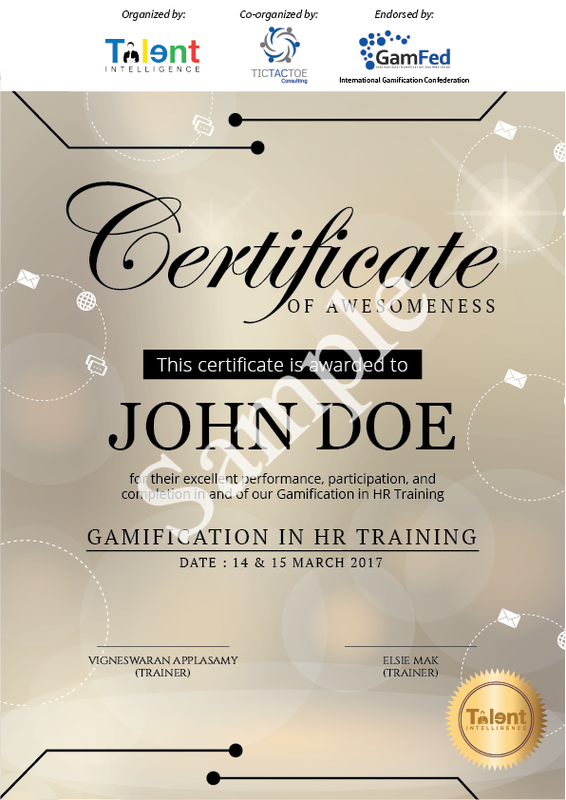 Our gamification workshops are endorsed by the International Gamification Confederation (GamFed), which reviewed and determined the best practices of gamification to be applied in specific areas of HR. We have trained and developed our trainers using frameworks that were designed from the world top gamification gurus like Yu-Kai Chou, An Coppens, Andrzej Marczewski, Pete Jenkins and much more to ensure the content delivered is aligned with international best practices and standard.